The subjects of beings from another planet visiting ours has persisted throughout modern American history, from War of the Worlds to V; most are hostile, but in the worlds of District 9 and E.T. the Extraterrestrial, some “come in peace.” Such is the case with The CW’s mid-season premiere, Star-Crossed. On September 17, 2014, a group of aliens known as Atrians lands on Earth to a hostile reception from the US military. More than a few die, and the rest are captured in the “invasion.” 10 years later, in the not-so-distant future, wary humans have put the aliens, referred to as “Tatties” due to the tattoo-like markings on their faces, into The Sector and keep them on curfew. Due to negotiations between the leader of the Atrians and the humans, a group of Atrian youth is allowed to attend Marshall High School to see if the aliens can integrate into society. Among them is Roman, a survivor of Arrival Day, who notices Emery Whitehill and recognizes her as the girl who hid him after he escaped the assault the day he landed on Earth. Of course, the other students don’t take to the Atrians very well, and an altercation between the visitors and the students affords Roman the opportunity to express his feelings for Emery, as she’s the only person who ever showed him kindness since Arrival Day. Now, Emery is caught in the growing tension among the humans and her feelings. The CW draws on a pool of mostly unknown (to the mainstream) talent; however, they bring a big hitter with Aimee Teegarden, of Friday Night Lights fame, who packs quite the punch with a mix of strength and emotion to Emery. The feeling of being torn between how she feels, and her experience living in a world constantly gripped by fear of the unknown is ever-present on her face. Teegarden definitely wears it well! Roman bears the same conflict, but his stony exterior and internal fire are wonderfully brought to life by Matt Lanter. You might know him better as the voice of Anakin Skywalker in the CGI Star Wars: the Clone Wars series. Of course, the CW also dips back into familiar waters, and fans of another CW hit, The Vampire Diaries, might recognize Malese Jow (Anna) as Julia, Emery’s cancer-ridden best friend. 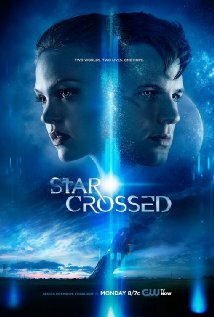 The computer-generated effects in Star-Crossed are impressive, from the alien ship to Roman using “cyper”, and they integrate themselves seamlessly into the live-action. The contrast between The Sector and the rest of the town is stark, but different enough to keep things interesting and convey the themes the series producers’ wanted. Speaking of which, like District 9, Star-Crossed is overflowing with underlying themes, the most apparent of which is how humans would react to an alien presence on Earth. Of course, it isn’t favorable, but it offers somewhat terrifying insight into how mass panic can affect how we react. There’s also the omnipresent segregation between the Atrians and humans, and the element of introducing aliens into schools, is a strong parallel to integration in America during the Civil Rights movement, and the notion of adverse reactions to that hasn’t changed in the slightest. Of course, this also brings up the “forbidden love” trope, but with the advent of Twilight, The Vampire Diaries, and even Romeo & Juliet, this is nothing new. Catch Star-Crossed on the CW Mondays at 8. Lean more and watch episodes on their website. Check out other TV reviews in out TV section.